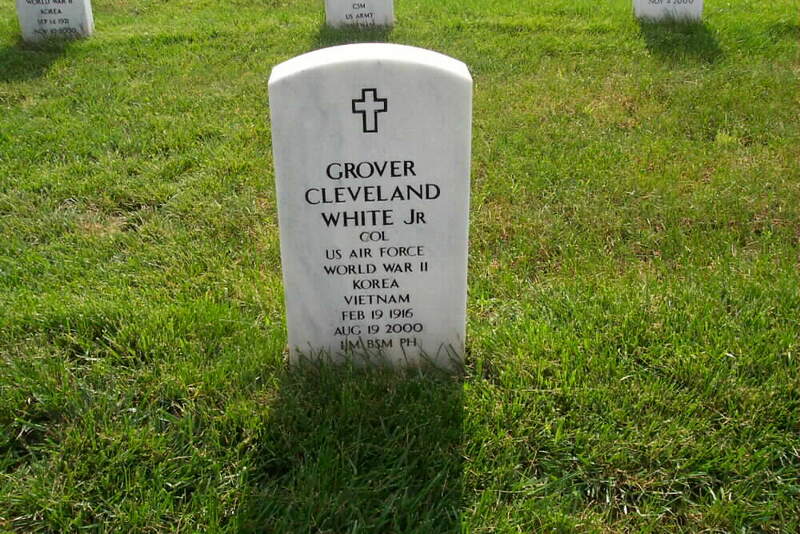 Colonel Grover Cleveland White Jr., 84, passed away on August 19, 2000. Colonel White was born on February 19, 1916, in Somerville, Texas, son of Grover Cleveland White and Adeline Estelle Hancock. An only child, Colonel White grew up in Bryan, Texas, where he was President of his class at Stephen F. Austin High School. Colonel White became the first person in his family to attend college when he enrolled at Texas A&M. He studied electrical engineering and rose to the rank of Captain in the ROTC Cadet Corps. He graduated from Texas A&M in 1939 and received a commission as a Second Lieutenant in the Army Signal Corps. While still a cadet, Col. White met his wife-to-be, Frances Elizabeth Beard. The two dated for several years, married on June 8, 1941, and were immediately posted to Fort Shafter, Honolulu, Hawaii. The couple's honeymoon was spent driving from Texas to San Francisco to catch an ocean liner bound for Hawaii. Lieutenant White was assigned to duty as a Wire Officer in the Signal Company Aircraft Warning, Hawaii. In this capacity, he worked on one of the first operational radar installations in the world. Lieutnant and Mrs. White survived the December 7, 1941, attack on Pearl Harbor. After the attack, Lieutenant White helped rebuild the communications and radar infrastructure in the Pacific. He saw action in Hawaii and Saipan and was decorated multiple times, including the Bronze Star and the Purple Heart. Lieutnant White was promoted rapidly in the Pacific Theater. As a Major in 1944, he returned to the mainland to help organize the Continental Air Forces, which later became the Strategic Air Command. Major White became one of the first members of the United States Air Force when he accepted a commission as a regular officer in June 1947. Shortly thereafter, he was the principal communications planner for the flight of the "Lucky Lady", the first non-stop round-the-world flight. Colonel White built a 30-year career in the military. His assignments included the Air Proving Ground Command (Pensacola, Florida), United States Air Forces Europe (Wiesbaden, Germany), Air Research and Development Command (Baltimore, Maryland, and Andrews Air Force Base), Defense Communications Agency (Washington, D.C.) and the Office of the Secretary of Defense at the Pentagon. For much of the latter part of his military career, Colonel White helped plan and manage the Defense Satellite Communications Program. His peacetime decorations included the Legion of Merit and both the Air Force and Army Commendation Medals. While in the military, Colonel White also raised a family. A daughter, Shelley Jeanette, was born in 1947. A son, Grover Travis, was born in 1949. Colonel White retired from the military in 1969, and began a second career with Computer Sciences Corporation. While with CSC, he managed major systems acquisitions for the Naval Electronic Systems Command. Colonel White retired from CSC in 1983. Colonel and Mrs. White retired in the Washington, D.C. area. They were charter members of the United Methodist Church of the Redeemer and were active in the congregation for more than 35 years. Colonel and Mrs. White also participated in numerous civic and cultural organizations, including the Smithsonian Institute, the Friends of the National Zoo, and the National Geographic Society. Surviving Colonel White are his daughter and son-in-law, Shelley White and Ron Fones of Easley; his son and daughter-in-law, Travis and Suellen White of Paris, France; his three grandchildren, Travis Smith Barbary, Elizabeth Barbary Nix and Travis Elliot White; and his two great-grandchildren, Chase and Colton Barbary. Colonel White's remains have been cremated and will be interred at Arlington National Cemetery. A memorial service will be held at Easley Presbyterian Church today, 22 August, at 4 p.m. The family will receive friends in the church immediately after the service. In lieu of flowers, memorials may be made to the United Methodist Church of the Redeemer, 1901 Iverson St., Temple Hills, MD 20748.